I’ve always been a pie girl. To me there’s nothing quite like the combo of warm baked fruit and a light and crumbly crust for those comfy cozy fall-time feels. But for many, this classic comfort dessert seems a bit too daunting with all the steps. Well my friends, may I introduce to you the galette. For those of you who aren’t already familiar with this rustic favourite, it’s basically the bottom of the pie, folded over top of the filling so that the lovely fruit centre peeks out in what is truly one of the most gorgeous little wheels of delight. With this method you don’t have to roll out two separate layers, worry about tricks and techniques for pre-baking, crust-edge-protecting, or strategically poking holes throughout the top to let the contends breathe – it does all that for you! This is one reason why so-called “peasant recipes” are amazing – they’re efficient, fun, and warming to the soul. This particular recipe is made with a gluten-free and refined-sugar-free crust, as well as thinly sliced apples, but of course you can fill it with different types of seasonal fruit (pears, peaches, plumbs etc. ), and then play around with the spices and flavourings if you feel so inclined. Serve it a little warm with a generous scoop of your favourite ice-cream, and prepare yourself for high praise from friends and family members who are lucky enough to enjoy a slice with you! Using an electric mixer (like a KitchenAid) with the blade attachment, combine the flours, coconut sugar, and salt. Add in the butter/ghee and mix until it resembles a coarse flour. Add the cold water, one teaspoon at a time, and pulse until the dough begins to stick together (it usually takes about three or so teaspoons). Form the dough into a flat disk, dust with a bit of tapioca flour, and place in between two pieces of parchment paper before transferring to the fridge to chill for about 30 minutes or so. While it’s setting, preheat your oven to 350F. 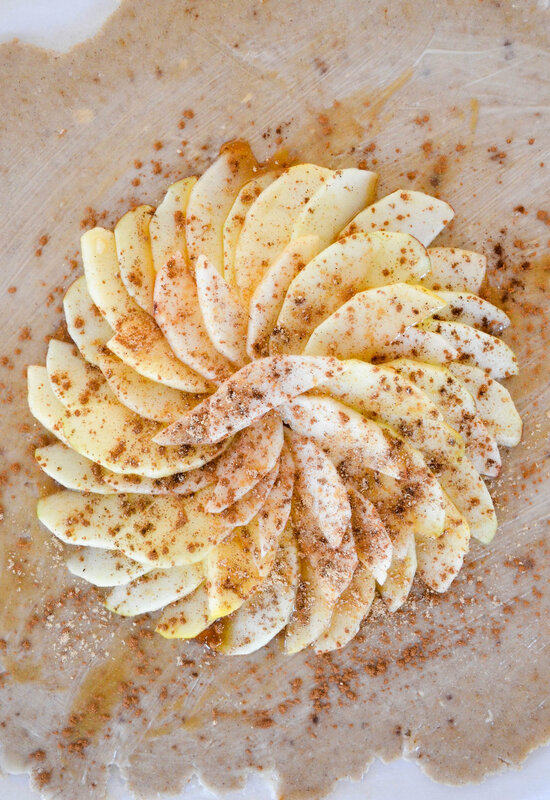 Combine the sliced apples, maple syrup (or coconut sugar), vanilla, lemon juice, and spices in a mixing bowl, and very gently toss to combine. Remove the dough from the fridge and gently roll it out between the two pieces of parchment paper into roughly a 10 inch round disc. Carefully place the rolled out dough onto a large baking sheet so that one of the parchment pieces is still below it. 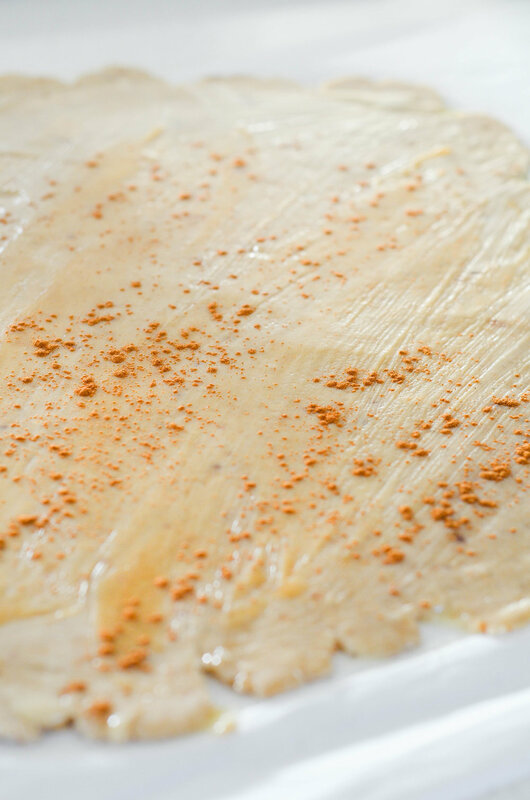 Brush the dough with a very thin layer of melted butter/ghee and sprinkle it with a teeny bit of spices. 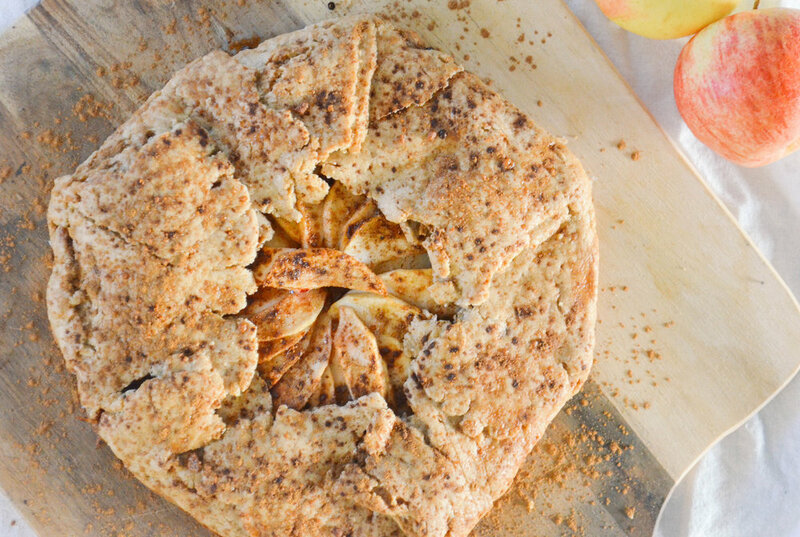 Arrange the apple slices in the center of dough, leaving a couple inches of crust on the outside. I like to make an overlapping spiral but feel free to arrange in any way that makes you happy. At this point you can also drizzle the apples with a little extra melted butter if you have it lying around. Gently fold the dough, pleating it nicely over the apples as you go. Lightly brush the crust with the egg wash and sprinkle on the additional coconut sugar and spices. 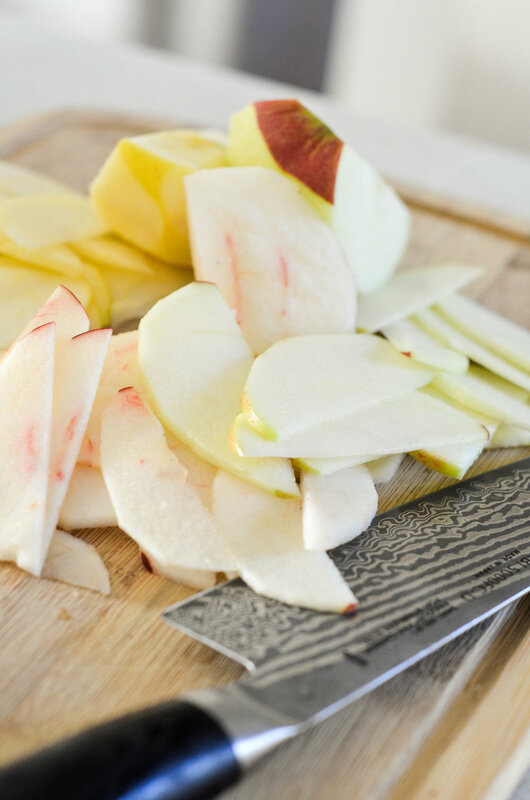 Bake for 40-45 minutes, until the crust is golden brown and the apples are tender. Remove from the oven, let it cool a bit, and serve slightly warm or room temperature. WELCOME TO WHOLE HAPPY - your nutrition and wellness hub dedicated to helping you feel your best inside and out so that you can experience the world as your most vital self.